Biotium offers a wide selection of fast- and slow-responding fluorescent membrane potential dyes, and synaptic vesicle dyes for monitoring nerve terminal activity. Jump to a section below, or see a list of products. Translational (or slow-responding) membrane potential dyes undergo a change in their membrane distribution as a result of changes in membrane potential. The fluorescence of DiBAC4(3) is enhanced with membrane depolarization. The rate of fluorescence response of the dye is slower than styryl dyes like the ANEPPS dyes (see below), but the fluorescence change is significantly larger. DiOC2(3) has been used for measuring membrane potential in bacteria. The green fluorescent dye forms red fluorescent aggregates with increasing membrane potential, allowing ratiometric potential measurements. DiOC5(3) and DiOC6(3) are two of the most widely used carbocyanine dyes for membrane potential measurements. Tetramethylrhodamine ethyl ester (TMRE) and Tetramethylrhodamine methyl ester (TMRM) can be used for quantitative measurements of membrane potential and mitochondrial membrane potential. The membrane localization of the fluorescence quencher dipicrylamine (DPA) is a function of the polarity and magnitude of membrane potential. The DiO/DPA system detects cytoplasmic membrane potential changes using the principle of fluorescence resonance energy transfer (FRET). The green fluorescent membrane dye DiO is a “stationary” FRET donor while DPA acts as a mobile FRET acceptor, resulting in a membrane potential-dependent quenching of fluorescence by FRET. The DiO/DPA system has been reported to produce a fluorescence signal change of >56% in HEK-293 cells and >25% in neuronal cultures and brain slices per 100 mV membrane potential change. Fast-responding membrane potential dyes are styryl dyes that undergo changes in fluorescence intensity in response to changes in membrane potential, on the order of 2-10% change in fluorescence per 100 mV. The dyes also undergo spectral shift with changes in membrane potential, allowing ratiometric measurements. Fast response dyes have been used to measure electrical activity in neural and cardiac cells. Di-4-ANNEPS has been used for studies of human stem cell-derived cardiomyocytes. Di-8-ANNEPPS is more hydrophobic and better retained in the outer leaflet of the plasma membrane than Di-4-ANNEPS, and therefore is more suitable for long-term membrane potential studies. It is also more photostable and less phototoxic than Di-4-ANNEPS. Di-2-ANEPEQ (also known as JPW 1114) is a highly water soluble fast-responding dye that is usually introduced into cells by microinjection. Di-8-ANEPQ and Di-12-ANEPQ are successively more hydrophobic, and have been used for potential-sensitive retrograde labeling of neurons. RH237, RH414, RH421, and RH795 are fast-responding potentiometric probes generally used for functional imaging of neurons. RH421 exhibits >20% fluorescence change per 100 mV on neuroblastoma cells. These dyes can differ in their physiological effects, for example RH414 causes arterial constriction during cortex staining, while the spectrally similar dye RH795 does not. 1Ex/Em is shown for dyes in methanol. In cell membranes, spectra of styryl dyes are typically blue-shifted by as much as 20 nm for absorption/excitation and 80 nm for emission. 2Spectrally similar to the ANEPPS dyes. SynaptoGreen™ and SynaptoRed™ nerve terminal probes (originally called FM® dyes) are membrane dyes used to trace endocytic vesicles. They are a series of fluorescent cationic styryl dyes developed to follow synaptic activity at neuromuscular junctions or synapses. The dyes label synaptic vesicles in neuronal tissues and cultured neurons in an activity-depending fashion. They also can be used to label endocytic vesicles in other cell types. Nerve terminal dyes have highly hydrophilic, cationically charged head group at one end with lipophilic tails at the other end. They are virtually non-fluorescent in aqueous solution, but become intensely fluorescent in membranes. Following nerve stimulation, the dye molecules are internalized in newly formed endocytic vesicles. During exocytosis, the dyes are released from the vesicles along with neurotransmitters, causing a decrease in fluorescence signal. As a result, the change in fluorescent intensity reflects the amount of endocytosis/exocytosis or synaptic activity. The rate of fluorescence increase during endocytosis (on-rate), and the rate of fluorescence decrease during exocytosis (off-rate) vary from dye to dye. AM dyes and HM dyes are fixable nerve terminal dyes. After staining with these dyes, cells can be fixed and permeabilized for subsequent immunostaining. See the table below for a list of nerve terminal dyes and their properties. Figure 2. General structure of SynaptoGreen™ and SynaptoRed™ dyes. Figure 3. General structure of AM fixable nerve terminal dyes. 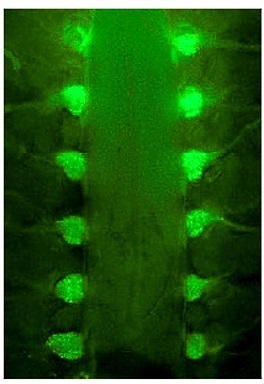 A common problem encountered with nerve terminal dyes is background fluorescence due to residual membrane staining, even after extensive washing. To reduce this background fluorescence, we offer three quencher or dye-clearing agents. ADVASEP-7, a sulfonated β-cyclodextrin, forms a water soluble inclusion complex with SynaptoGreen™ C4 that can be removed more effectively by washing. Biotium’s unique quencher, SCAS, reduces background fluorescence as soon as it is added to the preparation without the need for washing. Sulforhodamine 101 quenches SynaptoGreen™ background staining via fluorescent resonance energy transfer (FRET). We offer these reagents as individual products and in kits with dyes and the quencher/dye-clearing agents. Figure 4. Neurons in mouse dorsal root ganglia (DRG) labeled with AM1-43. Image courtesy of Dr. David Corey, Harvard Medical School. Also see Figure 6. *m is the number of carbons in the lipophilic tail and n is the number of double bonds linking the two aromatic rings in the dye. **The positively-charged end of SynaptoRed C2M is a trimethylammonium group. Visit our Neuronal Probes & Tools Page, to learn about our selection of toxins, fluorescent receptor probes, primary antibodies, and more.